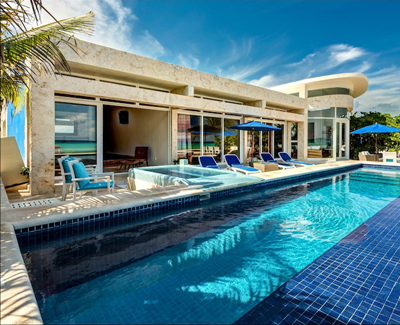 Beach House is a chic contemporary oceanfront private oasis offering 4 bedrooms in the exclusive gated community of Playacar. This vacation home will provide luxury, comfort, relaxation and location on one of the world's finest beaches! Enjoy the soft white coral sand and crystal clear aquamarine waters of the Caribbean Sea. This is your front yard. Beach House has unique amenities such as a freshwater swimming pool overlooking the beach, a gourmet kitchen fully equipped for on-site cooking, a grill, and four private bedrooms with individual bathrooms that gives you privacy along with beachfront access to local adventures and activities. Lounge on your private stretch of beach that extends from the house with a book or take a luxurious massage while listening to the waves and feeling the refreshing breeze off the ocean. Nearby are the Mayan Ruins of Tulum, Coba, and Chichen Itza. Or, ferry across from Playa De Carmen to the island of Cozumel for snorkeling or scuba diving.